Who Flies? What do they Fly? How Much does it Cost? People from all walks of life fly microlights and light sport planes. There are some 1,600 people with NPL licences in Sourth Africa. The Microlight and Light Sport Aeroplane Association of South Africa is the representative body that represents NPL Pilots. Flying is an exciting and exhilarating sport. Flying LSA and Microlight Aircraft is not a step up or down, but a step into a completely different and exciting sector of the flying community. Flying LSA and Microlight Aircraft has been described as a step into "high performance slowness." While there are similarities to other type certificated aircraft, there can be major handling differences. Most of all, in this sector of recreational aviation, you will find the true essence of flight. Be assured that the same exacting standards of safety are applicable to LSA and Microlight aviation as are applicable to any other form of aviation. The NPL may be more affordable but the end product is no less of a product than that received in any other form of recreational aviation. From a young age, many of us have thought about flying. At some stage, it is likely that all do have an interest in aviation. On this page we will take you on a journey commencing with: " What is a Microlight?" Then we will cover how you become a "Microlight Pilot" after your fun scenic introductory flight, the likely cost of a licence and end with an aircraft acquisition checklist. Actually, there is no such thing as a "Microlight Pilot's Licence" as one is awarded a National Pilot's Licence (NPL) that is endorsed to specify the category or categories of aircraft that the licence is valid for. This said we all refer to each other as Microlight Pilots! Microlights come in two basic configurations – weight-shift and the three axis fixed wing variety. They range from very basic inexpensive weight-shift aircraft to state of the art high tech airplanes that cruise at 120 knots and cost over a million Rand. The main limiting factors are two seats, low weight and a slow stall speed. Three axis planes also come in tail draggers. What are these? Essentially a three axis plane has a nose wheel and a tail dragger has a tail wheel. When you have mastered the art of flying one of them you will understand that it is a question of choice. For now, get hold of your travel bag with two wheels and a handle. Pretend that you are the third wheel. Take a jog with the bag behind you to get the feel of a nose wheel configuration. Now, take a jog with the bag in front of you to get the feel of a tail dragger. Once you’re in the air, you guessed, you have no wheels! On average what do they cost? Weight-shift and the three axis fixed wing planes which are often called light sport planes offer perhaps the most exciting and least expensive entry to powered flying. Let me put it this way. How much does a car cost? Ok, it depends on what you are buying and what extras you feel you need. This said, you could pick up a second hand weight shift trike from about R50,000 and you could pay up to about R1,000,000 for an imported top of the range version with most extras included. A second hand three axis plane may cost you from about R150,000 to a top of the range version with all extras at about R1.5 million. If you want to pay for “bling” (expensive toys) you could pay more but on average preowned trikes on average cost between R50,000 to about R300,000 and three axis planes cost about R850 000. Bargains in the second hand market and part ownership shares are also not uncommon. How much does a pilots licence cost? Again, the price differs. Young people tend to need less instruction with older people wanting more than often is needed. You need a minimum of 25 flying hours but doing double this is not uncommon. To obtain a microlight pilot’s licence, you require a minimum of 25 flying hours, of which a minimum of 10 hours is dual flying (with an instructor) and 15 hours solo are required. On average if you are less than 30 years of age most student microlight pilots take about 25 flying hours to qualify. If you are older than 30 years of age average flying hours needed will rise by 10 hours if you are under 40 years of age after which you can expect to need about 50 hours. For weight-shift (flex wing) aircraft. Current costs per hour vary upon the plane flown but average at about R1,000 per hour with fuel. For light sport (fixed wing) aircraft. Current costs per hour again vary on the plane flown and the location ofthe school but expect to pay in the region of R1,400 per hour with fuel. Fuel costs vary per aircraft but allow for about R150 per hour if you are quoted without fuel. Your Instructor will sit with you to determine your needs and desires and advise on a budget that will be based on the plane flown and the expectation of the extent of instruction that you should anticipate. The total cost will include books, ground school, radio licence, medical etc and will normally cost between R35,000 and R50,000 for a weight shift microlight licence. You will need to explore the cost estimates for different types of aircraft and in big cities you can get a a quote from a couple of flight schools. The hours needed to obtain a microlight pilot’s licence on a conventionally controlled microlight from flight school to flight school depending upon location. On average allow for quoted minimum hour packages to cost more than the cost of flying a weight-shift plane. From one type of weight-shift microlight to another – one hour. From one type of fixed wing microlight ( nose wheel or taildragger) to another in the same class – two hours. 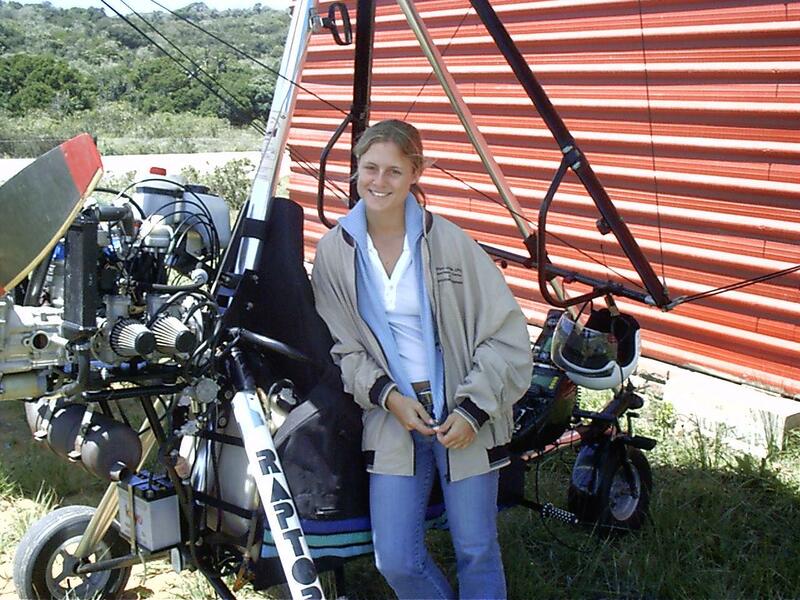 From a weight-shift microlight to a three axis (nose wheel) microlight – 15 to 20 hours. From a weight-shift microlight to a taildragger – 25 to 30 hours. From a three axis microlight to a tail dragger – 10 hours. If you are wanting to do your private pilot’s licence (PPL), then microlighting offers you an alternative route to a PPL, as there are several flying schools that will accept half of your microlight flying hours, up to a maximum of 12.5 hours, as contributing to the 40 hours that are necessary for a private pilot’s licence. To do a PPL you have to fly a minimum of 40 hours to complete your private pilots licence. On average it will take 40 – 50 hours to complete the required syllabus and pass the private pilots flight tests. This is again purely a factor of flying ability and varies from person to person. Expect to pay about R70,000 to R100,000 for a PPL. Do I have to buy a plane first? Nearly all experienced pilots will tell you to get a licence before you buy a plane for recreational purposes. This said, some eager beavers have been known to buy a plane, build a hangar and even build their own airstrips before they get a licence. A true story is that of a "Granny" who bought a microlight training school before she got her pilot's linence. So, it is a passionate pastime and exceptions abound. Microlight and light sport flying is recreational flying however we have the same total commitment to safety and airmanship that all forms of flight necessitate. Your instructor who takes you flying will answer all your questions and map out a flying training course for you that suits your needs and pocket. You have nothing to loose by taking an introductory flight and it might just open up an exciting rewarding chapter of your life that many only dream of. What licence should I get? This is a tough question that only you can answer. To assist you in deciding you should have a flight in a weight-shift trike and you should have a flight in a three axis plane. How far can you fly in a microlight? On average a weight shift microlight flies at 80 km per hr and three axis planes fly at about double this. Having a flight endurance without refueling of 3 hours is not uncommon but many variations of fuel tank capacity and engine consumption ensure that these estimates will vary widely from plane to plane. A number of well known adventures are covered in books and on video about Microlight Pilots flying from Chile to Cape Town and around the world in microlights just like those above. 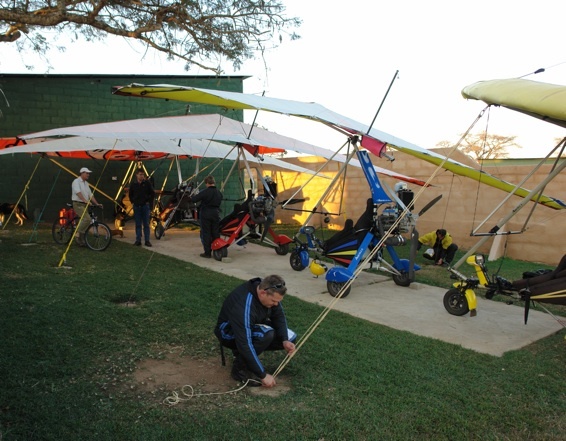 Pictured above are microlights upon arrival at a week-end fly away to Barberton from Johannesburg. Others tell of flying, in the Transkei, from dawn to dusk, up and down the coastline, after a two day flight from Johannesburg whilst sardine spotting. Then again, a 10 minute introductory flight "near diepsloot" after leaving the office in Sandton at the end of a hectic day of deals and pressure may just have you "hooked" for life! What do experienced pilots look for when they decide to fly or decide to buy a plane?